The weight of the world, it might be said, rests upon agriculture, and here is where we face the need to decide our future, to choose between industrial models of food production and humbler, more environmentally benign approaches. The industrial model of agriculture was supposed to solve the problem of global hunger, yet despite an impressive beginning, its results have been a mixed bag. While it has led to increased productivity, over the long term it has had harmful consequences for both people and the planet. For the planet, it has been a prolific source of carbon emissions; some estimates are that it contributes up to 32% of human-caused greenhouse gas emissions. For small-scale farmers and peasants toiling on their small plots of land, it has brought waves of landgrabs, massive debts, and the uprooting of their traditional cultures. But the peasants are fighting back, and the umbrella under which they have gathered is the international movement called La Via Campesina. 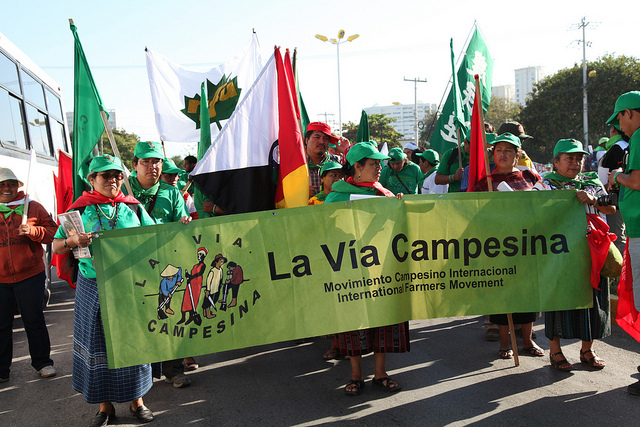 La Via Campesina is an autonomous, pluralist and multicultural alliance, independent of any political, economic, or other type of affiliation. It comprises about 164 local and national organizations in 73 countries from Africa, Asia, Europe, and the Americas, representing about 200 million farmers, landless people, women farmers, indigenous people, migrants and agricultural workers from around the world. At the heart of La Via Campesina is recognition of the dignity of small-scale farmers and the advocacy of agro-ecological modes of production as a sustainable, people-friendly alternative to corporate-dominated industrial agriculture. The governing concept of La Via Campesina is food sovereignty, which means that farmers have full control over the land on which they work and grow the crops that they want to grow and need to grow, using natural, ecologically sustainable methods of cultivation. “We are La Via Campesina” is a 15-minute video about the movement, shot during the 2015 World Social Forum in Tunisia. While the video is by no means a masterpiece of videography and would have benefited from more skilled direction, it offers a range of insights from men and women leaders of member organizations who discuss their struggles for social, economic, and climate justice. Elizabeth Mpofu, from Zimbabwe, speaks about the challenges that women farmers face. In traditional countries, she explains, most farm work is done by women, but because of the dominant patriarchal system, women are seldom given the full opportunity to enjoy what they produce. She insists that to gain their proper rights, women have to work together and even be ready to fight. Samah Darwish from Palestine speaks about the special problems that Palestinian farmers face in a region where their land is constantly being taken from them by Israeli settlers. The Palestinian farmers who protest against this incursion face arrest by the authorities and attacks by Israeli settlers. She sees food sovereignty to entail that farmers have full control over the land and resources. Ndiakhate Fall of Senegal insists on the need to globalize the struggle of farmers and workers against the neoliberal capitalist system, which, he says, has been destroying the economic and social base of countries in the global South. He highlights the plight of African farmers, who have been evicted from their farms by the multinationals that arrive and gobble up huge tracts of land. Those farmers who remain on the land still find that they cannot sell their produce, which is being undercut by imports from the West that can sell more cheaply because they are sustained by subsidies. Badrul Alam of Bangladesh calls attention to the danger of climate change, a major threat looming over his country. If current trends continue, he says, the southern part of Bangladesh will go underwater, forcing 30 million people to migrate to the north. In 2007 and 2009 Bangladesh was struck by powerful cyclones that caused immense damage to the country’s farmland and killed thousands of people. As greenhouse gas emissions continue to rise, the future for his country looks bleak. This short video bears testimony to the unity of voices emerging among the peasants and small farmers of the world. Whether they come from Africa, Palestine, South Asia, or South America, or even the US, the same themes are repeatedly emphasized, the same struggles are being waged. It is the struggle of the small against the great, of David against Goliath: to stop landgrabbing, to preserve the right to water, to avert the perils of climate change, to achieve food sovereignty, to resist chemical inputs, and to preserve and share seeds without threats by multinational corporations. The key to victory, explains Carlos Marentes of the Border Farm Workers Project in the US, lies in solidarity, in the commitment to stand together, in the principle that an attack against one is an attack against all. This entry was posted in Agriculture, Ending global poverty, Food security, News item, Politics & food justice, Social justice, Uncategorized and tagged Climate change, food justice, Global hunger, La Via Campesina, Social justice, sustainable agriculture. Bookmark the permalink.